By refusing to go digital and keeping your files stored on microfiche, you are shunning an efficient, up to date, cost effective and even more space saving solution to managing your documents. Microfiche are small card-like materials containing pages of information that have been significantly reduced in size and printed onto the transparent film section of the card. They have been used for alternative document storage for almost one hundred years. So let's take a look at the pros and cons of storing documents like this. 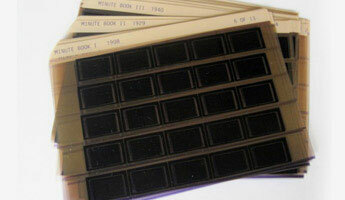 Space Saving- In their time, microfiche offered the best space saving solution there was. Each microfiche would be stored in an open top envelope and then stored in boxes and cupboards in libraries, museums and businesses. Long Lifespan- Microfiche have an estimated lifespan of around 75-100 years depending on how they are stored. Protects Original Documents- Storing files on microfiche protects the original documents from fingerprints and manual handling damage. Equipment Needed- Microfiche can only be viewed using a microfiche reader which is bulky and can be expensive. Susceptible to Loss, Theft and Damage- Microfiche themselves can be lost, stolen or damaged just like their paper counterparts. Not Flexible- Because of the need for a microfiche reader to view the files, microfiche are not very flexible at all and they can't really be shared. Since the invention of the computer, its development and the rise of 'smart' devices, lots of processes which were once manual have gone digital. 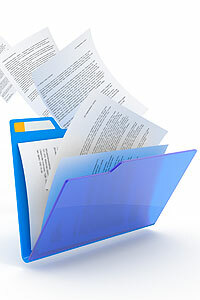 This includes document storage with a lot of businesses storing files in shared computer networks, on multiple devices or even in the cloud. In the interest of fairness, this method also brings pros and cons so let's have a look at what they are. Sharing- There are lots of ways your documents can be shared digitally such as over email, shared networks or cloud platforms. Space Saving- Digital files are even more space saving than microfiche because they take up no actual space, only virtual, allowing you to free up valuable office space. Time Saving/Efficient-Digital files offer quick access, editing and sharing with quick file retrieval of fully indexed documents too. Managing- To fully benefit from digitised documents, you must have a system in place to enable you to manage the files efficiently. Security- While digital document storage is still the safest way to store documents, you have to take security seriously and implement the necessary steps to ensure data protection. Poor Scan Quality- Your files may have become so damaged before you decided to have them scanned that the quality of the digital image is not what you want so you have to make that decision before it's too late. If you have been convinced to go digital with files previously stored on microfiche then we can help. Here at Pearl Scan we offer an excellent, fully bespoke microfiche scanning service with the infrastructure to handle small to large scanning projects. Following the scanning, you will be given fully indexed, high quality digital documents in the format you have required and they can even be OCR processed if you wish. For those companies who don't already have software in place to help them manage digital documents, we also provide our image management software, Halogen free of charge. For more information about how we scan microfiche or for your free, no obligation quote, get in touch and speak to a member of our friendly and experienced team.